Abbabiya Abba Jobir Returns to Ethiopia; Leenco Lata & Dima Nego to follow soon? News of Abbabiya Abbaa Jobir's return to Ethiopia hit the Oromo Diaspora with a mixture of astonishment, surprise or as an expected event. 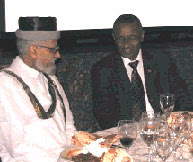 Abbabiya returned to Ethiopia following a peace negotiation/mediation in The Hague, The Netherlands, between the TPLF government of Ethiopia and some former OLF personalities (and some “Oromo elders”) between Sep. 19 -21, 2008. The mediation effort is said to be spearheaded by Prof. Ephraim Isaac. It is confirmed that Obbo Lenco Lata and Obbo Dima Nego are among eleven others in attendance at the mediation meeting which, according to some reports, agreed to reconvene in Finfinne (Addis Ababa). Some observers speculate that all three of them attended the meeting on behalf of the Kemal Gelchu group which recently claimed to have deposed the Daud Ibsa group from leadership of [the Asmara Group of] OLF. Others, including Obbo Leenco and Obbo Dima, say they attended as Oromo individuals only. It is also rumored that the two gentlemen will follow Abbaa Biyyaa to Finfinnee shortly. Neither of the two gentlemen denied this rumor to put it to rest in spite of opportunities provided to Obbo Leenco by VOA and to Obbo Dima by an Oromo Pal Talk room. It is not clear in what capacity or for how long Abbabiya’s returned to Ethiopia. On a PalTalk interview he gave, the Kemal Gelchu group’s spokesman, Obbo Leenco Baatii, denies that his group has anything to do with the meeting and that either of the three gentlemen represented it. He also talked about contact with the mediator group being established prior to the split with the Daud Ibsa group and that it was necessary to finalize these talks. These contradictory statements have caused some observers to infer that the Kemal Gelchu group may have been represented at The Hague meeting by someone else whose name Obbo Leencoo Baatii was not willing to divulge. Given the huge credibility gap both sides suffer among Oromo nationals stemming from their past behavior of misinforming the Oromo public, and discrepancies between their words and actions, skepticism about the truth of their statements, especially official claims and pronouncements, are rampant among Oromos. Fired from his post as head of foreign affairs department for the [Asmara Group of] OLF for sub standard performance and used and discarded by the same group to sell AFD to Ethiopian audiences, Abbabiya Abbaa Jobir recently turned a peace maker. He established a “peace organization” he named East African Multilogue Center (EAMC). EAMC’s purported vision is “To secure peace, security and stability in East Africa, encompassing the states of Djibouti, Somalia, Kenya, Eritrea, Ethiopia and Sudan …” A one-time higher official of a liberation front and a recent supporter of an alliance of opposition groups struggling to defeat TPLF, Abbabiya now purportedly wants to bring peace to East Africa in general, and to TPLF and the Oromo people in particular. It is not clear whether he has the respect, credibility, neutrality or the personal traits required to undertake such a huge task. Sources close to him say that it is very difficult to pin down Abbabiya’s political and other beliefs and that his recent change of heart has more to do with self-interest than bringing peace to the region. It is not clear whether Abbabbiyya returned to Ethiopia in his capacity as “peace maker” on behalf of EAMC either. Neither is it clear if Abbabiya returned to Finfinnee as an individual to live there or to visit. Only time will tell. What do you think are the pros and cons of Abbaa Biyyaa’s return to Finfinnee for the Oromo struggle? Having been made aware of the Oromo predicament, for the first time, way back in the mid 70s, we were told in unambiguous terms “be watchful of the sons of the naftanyas who are fluent in afaan Oromo”. This simple but stark message brought home to me, at the time, the complexity of the struggle right away. I remember thinking how on earth one would be able to identify the ‘aramaas’ and protect oneself whilst running a clandestine revolutionary movement. I, for one, have never forgotten that warning. The pioneers of the modern Oromo national struggle appear to be farsighted and most certainly done their home work. Revolutionary vigilance was the order of the day during my youth. It remained the same until 1991. It would appear that we have dropped our gourds since the 1991 by forgetting the warnings of the pioneers not only against the Naftanya offspring but all sorts of hidden enemies. Collective amnesia is said to be the route to all political demises. Most unfortunately, however, just as collective amnesia was setting in during the mid 90s the difficult complex issues of the Oromo society began to raise their heads. One definite source of such difficulties involves the minority latent hopefuls who were not completely weaned of their Ethiopianist dreams. This group showed their true colour gradually but surely in the fullness of time. Bergen, the Asmara Group (now both factions) declarations of their commitment to democratize Ethiopia, AFD etc are but few examples. A more lethal challenge on the other hand, the problem of regionalism, a by-product of the Haile Sillasse’s divide and rule tactics, also began to bare malignant fruits since 1991. The proliferation of different Oromo political ‘organization’ or grouping is one aspect of such malaise. Groupings such as IBSO, OPLF, Gumii, AWO etc are breakaways from the OLF. They however epitomize a symbolic representation of the division among the Oromo, albeit artificial and the figment of the imagination of some people. They pull resources away from the OLF whilst declaring themselves pro independent Oromia. It is interesting to note that, however, none of the websites of these breakaways state clearly what they stand for. It would appear that they are not fully immune to the virus called ‘Ethiopia’. More worrying has been a recent development in the Oromo diaspora. The Oromo diaspora appear to be more divided these days than ever before in our history. They are divided primarily politically; the politics of Oromia and Ethiopia. Some believe in liberation of Oromia but some believe in regime change in Ethiopia that would allow them to return. Those who believe in Oromia support the OLF-TA whilst those who wish to preserve Ethiopia or just feel that they should go back home support the OLF-Asmara Group. Another more diabolic division is the recent split within the Asmara Group that is driving wages between Oromos. It is an open secret that these splits have been appealing to their supporter’s regional affiliations. Regional attachment is perfectly natural human behaviour. Political stand, however, is very personal and cannot be determined by these attachments. Nonetheless, the Asmara Group (both sides) exploit the apparently harmless natural phenomena for a harmful end to enhance their short term gain and out manoeuvring each other. The long term effect can be devastating. The other factor that complicates the difficulties is that there are two groups call themselves the OLF; the OLF-TA and the OLF-Asmara Group. They stand for two different aims and goals. The Asmara Group is again divided in to two. Both stand for democratization of Ethiopia. But they confuse people by saying two things two sets of audience. To Oromo they say they stand for ‘bilisumma’. To the Ethiopians and the ‘Faranjis’ they inform them they stand for unity of Ethiopia. What is more, there is yet another third split within the Asmara Group. This latest split is simply mindboggling. The old guards of the Asmara Group, led by Dima Nogo, Lencho Leta and Aba Biyya Aba Jobir, among others have formed a separate group and began talking to TPLF. This faction is the most malignant bit of the Asmara Group. They are the architects of predicament. The entire Asmara Group project was their mind child. They caused by all account an incalculable damage to the OLF. They caused the divisions in order to use the name of the organization to gain some sort of power in the Ethiopian power structure. Alas it has failed and now they are heading for Finfinnee even without their Asmara Group. As to their fate, time will only tell. No doubt we have a serious problem on our hands. The lack of maturity of the Oromo diaspora is only making matters worse. It seems to me that it is only by getting back to basics that we even begin to think to sort out the problems; political, religious, regionalism or otherwise. After a decade of in-flight I should imagine that we must by now know who stands for what. I hope those of us who stand for Oromia will come together sooner than later. That to me is the basics. I do not suggest that the problems will be solved overnight. What I would like to suggest is that let us take in deep breath and start to think. The warning of the founders of the OLF still rings loud after 30 years. Today, sons of naftanyas include, ex-Dergs, ex-EPRPs, ex-OPDOs, regionalists, Ethiopiansts, opportunists, etc because they all have common ideology; unity of Ethiopia. Thus, it requires rethinking and reorganizing oneself. I am sure it can be done but not until we understand what has befallen us.